Some of Sarah’s relatives have a house in Alaska, in a small town called Seldovia. 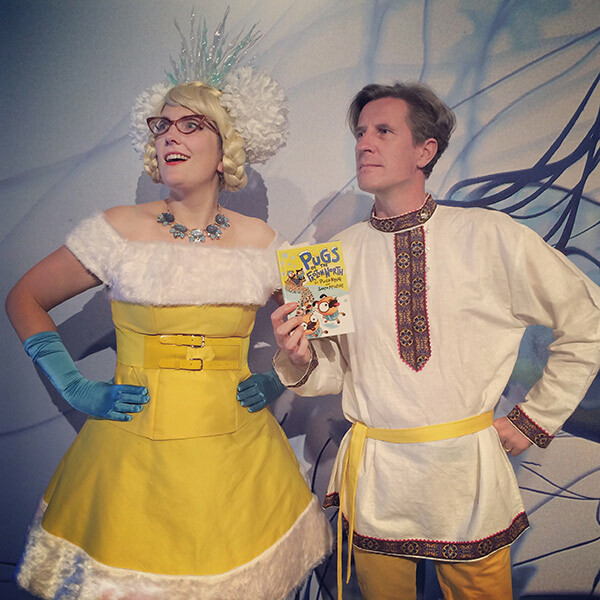 That inspired the town of Snowdovia, which is the starting point for an extremely adventurous sled-race to the North Pole in Pugs of the Frozen North. 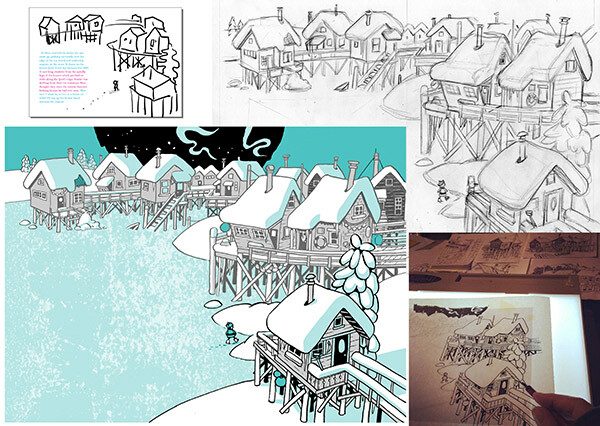 The picture in blue below is the one that appears in the finished book, and the others show how Sarah developed it from a very simple sketch, to a rough sketch, and then the finished pen-and-ink drawing. Sometimes, to save Sarah some time, Philip does the rough drawing and then Sarah finishes it in her own style. 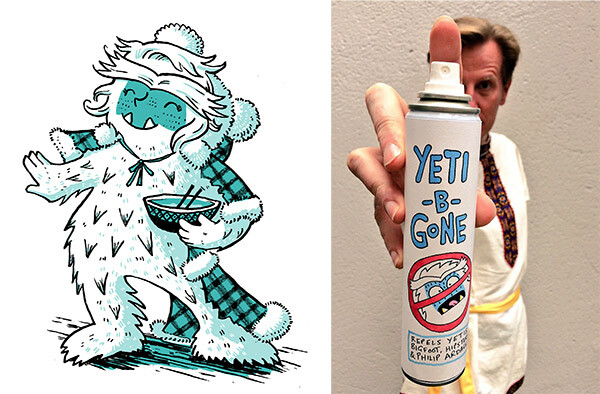 Here’s a yeti rough by Sarah, and a kraken rough by Philip. (You can check through the book and see if you can spot the other pages which Philip drew the rough for, but we’re not telling!) Making a book together is quite an adventure in itself. When we’re not busy writing and drawing we try to have real adventures, too. Sometimes they have to be quite small adventures. When Sarah is working too hard to go off exploring, she stays in her studio and explores strange new flavours by doing the #MYSTERYDRINK CHALLENGE, in which she tastes strange soft drinks so that the rest of us don’t have to. She says that so far, most of them have been Quite Nice. She hasn’t found any that have turned her into a yeti yet, but if one does, we’re prepared. Sometimes we find time to go on big adventures, too. This summer, Philip’s family went to stay with stay with Sarah’s family in the USA. Here we are hiking in the Cascade Mountains. Who knows what future book ideas that will spark off? (As you can see, the hike was a bit too much for Philip’s son Sam…). 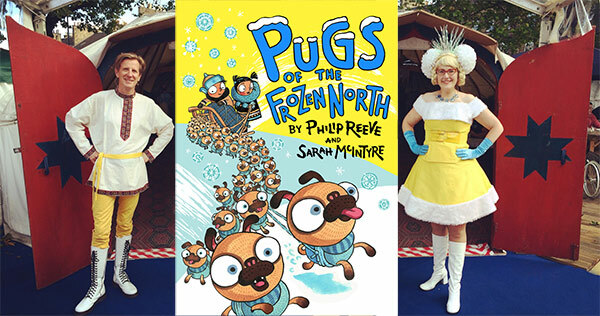 We came back to England to start our next adventure – touring all over the country to tell people about Pugs of the Frozen North. You can find a list of the events we’ll be doing here. And if you want to know how to draw your own pug, here’s Sarah’s step-by-step guide. 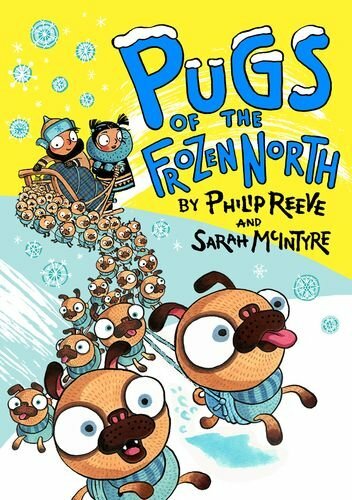 Pugs of the Frozen North is out now. Philip Reeve wrote his first story at the tender age of five about spaceman called Spike and his dog Spook. He is now best known for his Mortal Engines quartet but is also a talented illustrator and has illustrated several titles in the Horrible Histories series. Sarah McIntyre once applied for a job as a ship’s rigger, intending to run away to sea, but instead, she found herself studying illustration at Camberwell College of Arts and graduated in 2007. She has since become a writer and illustrator of children’s books, picture books and comics. ← How does a single photo of a single drowned child affect our shared knowledge?